Reports on recent College activities and a selection of announcements, events and initiatives in the wider education community. Larry Beardy, OCT, speaks about the power of his native Oji-Cree language and how it is his strength. "It connects with you here," he says, touching his heart. "And you cannot brush it aside." Beardy was one of 60 participants at Nourishing the Teaching Spirit: Conversation Circles Intended to Explore the Development of Additional Qualification (AQ) Guidelines for Teaching Native Languages. The Ontario College of Teachers and Queen's University hosted the language conversation at the Six Nations Polytechnic in Ohsweken, near Brantford, on February 28 and March 1. Native elders, members of cultural and language groups, language teachers and other educators filled every seat in the large circle of chairs in the Polytechnic's Grand Room. The participants included Onondaga Chief Arnie General and Cayuga Sub-Chief Leroy Hill. College Standards of Practice and Education Committee members Sharon Young Kipp, OCT, and Clyde Glasgow also attended. Many participants spoke passionately about preserving their languages, including Beardy, a special assignment teacher with the Keewatin-Patricia DSB and an Oji-Cree language teacher. "What's being done here is the right way. It'll be appreciated," he said. Eight language groups were represented: Cayuga, Cree, Delaware/Lenape, Mohawk, Ojibwe, Oji-Cree, Oneida and Onondaga. "Having the class of Onondaga language students and instructors there to converse with the College about positive steps to support Onondaga language teaching could constitute a historic moment, in that there are so few Onondaga-language speakers left - fewer than 50 in Canada as indicated in Contemporary Linguistic Analysis," says Kate Freeman, Acting Co-ordinator of the Aboriginal Teacher Education Program at Queen's University. "Some Aboriginal community sources suggest there may be fewer than that - perhaps 20 speakers or less. So it is a rare privilege to spend time with a number of these speakers gathered together. 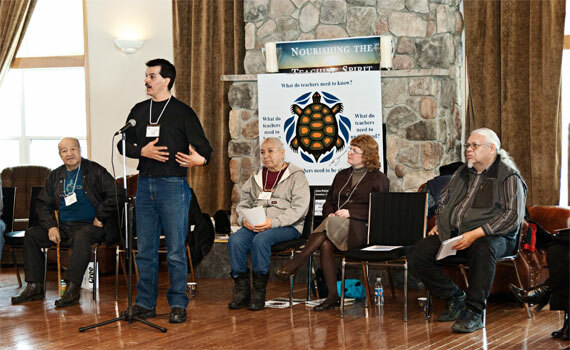 The presence of elders and other respected First-Nations-language speakers and educators from the various language groups in Ontario emphasizes the urgency and value of the conversations on appropriate and effective ways to support First Nations languages." This event was part of a series of conversations the College is co-facilitating to discuss First Nations AQ course guidelines. The College is committed to building its knowledge through the process of listening, engaging and collaborating with First Nations communities. "Thank you for making the sharing circle space so open, comfortable and engaging for us over these two days," said Leslee White-Eye, OCT, an education officer with the Ministry of Education's Aboriginal Education Office in London. "You gave individuals space and time to share concerns and issues related to policy development in general and issues related to AQ development specifically." "It was very meaningful professionally and personally in so many ways. Being able to just listen to critical debate in the language is a gift in itself." The College is committed to involving First Nations communities in the initial development of AQ guidelines so that courses honour the First Nations ways of knowing while reflecting their languages, cultures and traditions. "Many important perspectives and recommendations emerged from this dialogue," says Déirdre Smith, OCT, Manager of the College's Standards of Practice and Education Unit. "This process helped to support shared understandings, develop relationships and illuminate new insights for the College." Notes from each language group at the conversation circle, along with the list of issues and next steps discussed, were forwarded to participants. Participants recommended that the College continue further conversations with First Nations communities and organizations. Twenty-one AQ courses are related to Aboriginal teacher education and 13 belong to First Nations languages. The language courses are: Native Languages (Intermediate division), Native Languages (Senior division), Teaching Cayuga, Teaching Cree, Teaching Delaware, Teaching Mohawk, Teaching Ojibwe, Teaching Oji-Cree, Teaching Oneida, Native Languages (Parts 1, 2 and Specialist) and Honour Specialist - Native Languages.